Oh, the memories so many of us have of reaching into a circus-train shaped box and pulling out an elephant, camel, hippo, goat or donkey cookie. Animal Crackers are a favorite childhood treat, and HIC brings you the Mrs. Anderson’s Animal Cracker Cookie Cutter Set. This delightful collection of four cookie cutters (elephant, giraffe, zebra and lion) lets you create your own home-made animal cookies. Made of BPA-free plastic, the cookie cutters come with a spring-action that stamps a design into the dough while aiding in the release of the shapes. Perfect for homemade animal crackers, the set is also fun to use when creating decorative pie crusts, or baking gingerbread cookies. To use, roll out the cookie dough and sprinkle a little flour on the cutters to keep the dough from sticking. Press the cookie cutter firmly into the dough, then press the spring-action lever to emboss the design into the dough and release the cookie. Below is a recipe that is included with the set — but you can experiment and use your favorite cookie cutter recipe — You can even try making chocolate Animal Cookies. A portion of the proceeds from the sale of this item is donated to Careers through Culinary Arts Program (C-CAP). C-CAP works with public schools across the country to prepare disadvantaged high school students for college and career opportunities in the restaurant and hospitality industry. HIC is proud to support C-CAP by donating a portion of the proceeds from the sale of select items. To learn more visit ccapinc.org. In a mixing bowl, cream together the butter, sugar, salt and lemon zest. Mix in lemon juice. Scrape down sides of bowl to incorporate ingredients. Add 2 cups of flour into the mixture and combine until incorporated. Then, add remaining flour until dough begins to form a ball. Scrape the sides of the mixing bowl, incorporating all ingredients. Wrap dough ball in plastic and chill for at least one hour. Preheat oven to 350 degrees F. Lightly flour rolling pin and work surface. Once dough is chilled, roll out dough to 1/4″ thick. 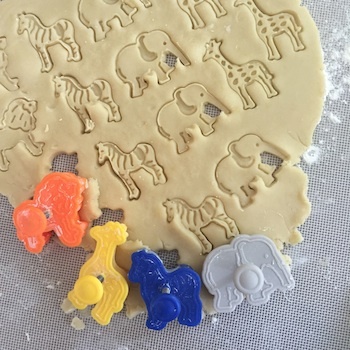 Use the Mrs. Anderson’s Animal Cookie Cutters to cut dough into desired shapes. Place cut Shapes onto baking sheet. Bake at 350 degrees F, for 9 to 12 minutes, or until edges are a light golden brown. The Lemony Shortbread Animal Cookie Recipe was created by Christopher Williams, who attended Richards Career Academy and graduated with a Scholarship from C-CAP to attend Johnson & Wales University in Colorado. He graduated in 2010 and currently works as a pastry chef. This entry was posted in Cook - Recipes from Friends on June 1, 2015 by HIC, Harold Import Co..